Because young bodies are still developing, proton therapy is an especially effective treatment for children. Proton therapy delivers a highly targeted dosage of radiation to the tumor while minimizing damage to healthy, growing tissue and vital organs. Proton therapy is non-invasive and has fewer side effects, allowing young patients to maintain their quality of life both during and after treatment. Texas Center for Proton Therapy has physicians who specialize in pediatric oncology. From our nurses to our child life specialist, the center is staffed with young patients in mind. Waiting on appointments and treatment can be difficult, so our pediatric patients can enjoy our children’s activity room and learning center. We can also work with families and schools to ensure our patients remain current on required schoolwork during extended treatment stays. The first step to determine if your child is a proton therapy candidate is to schedule an initial consultation. Prior to your visit, a member of our care team will call to discuss what to expect. You and your child will meet with one of our physicians, who will determine if proton therapy is the right treatment for your child. If your child qualifies for treatment, you will get all the information you need to make treatment as smooth as possible. If you are traveling from out of town, our Patient Support Services staff can help you arrange travel and lodging. Learn more about what to expect for your first appointment. If your child is a candidate for treatment, he or she will receive a CT simulation. This process may happen on your initial consultation day or be scheduled for later, depending on your child’s unique circumstances. Used for treatment planning, a CT simulation is an imaging process done prior to treatment in which the exact location, shape and size of the tumor is determined. Your physician and nursing staff will provide instructions for your child’s first proton therapy treatment. Timing and duration varies depending on the patient and type of cancer. A typical cycle includes daily treatments, Monday through Friday, for six to eight weeks. If your child needs anesthesia, one caregiver will bring him or her to a special room designed especially for our pediatric patients called the Sunrise Room. A member of our specialized pediatric anesthesia team will administer appropriate anesthesia in either the Sunrise Room or the treatment room. To make the experience as comfortable as possible, you can bring your child’s favorite comfort item. After treatment, your child will return to the Sunrise Room. A member of your child’s treatment team will bring one caregiver back to the Sunrise Room to be with your child when he or she wakes up. Christian’s parents were devastated when doctors discovered he had a malignant brain tumor. When his treatment plan included radiation, they chose Texas Center for Proton Therapy to reduce radiation exposure to 12-year-old Christian’s body. Twelve-year-old Christian was diagnosed with medulloblastoma, a malignant brain tumor, earlier this summer. He recently celebrated the end of treatment with all of his friends and family cheering him on! 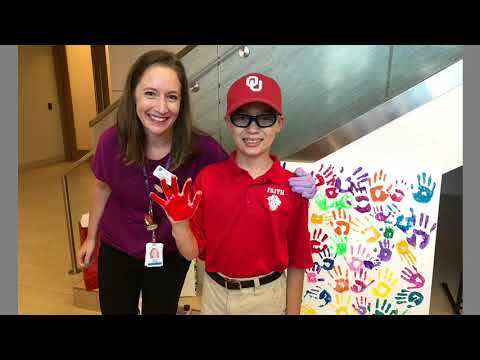 Christian added his handprint to the canvas as the 200th pediatric patient treated at Texas Center for Proton Therapy. Medical treatment of any kind can be new, unknown or even worrisome for a child. Our child life specialist is an expert in child development. Learn more about Child Life Services. The Pediatric Proton Consortium Registry (PPCR) is a multi-institutional prospective registry whose primary aim is to expedite quality outcomes research in pediatric patients treated with proton radioth erapy. The PPCR is unique in its scope and depth and is the most comprehensive multi-institutional, radiation-based pediatric patient registry in existence. 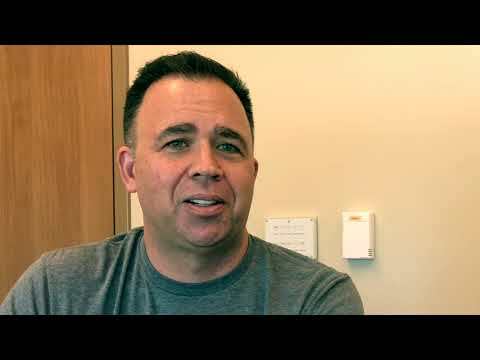 Learn more about how the PPCR benefits pediatric oncology.